President Ramon Magsaysay on his state of the nation address on January 24, 1954 (Photo credit: Presidential Museum and Library of the Philippines). On March 17, 1957, President Ramon F. Magsaysay, the so-called champion of the Filipino masses, died at the age of 49 in a plane crash in Cebu. Born on August 31, 1907 in Iba, Zambales, Magsaysay was elected as the country's seventh President in November 1953 and began his four-year term on December 30 of the same year. He had won the affection of the Filipino people because of his selflessness and dedicated leadership, even opening the gates of Malacanang to the common people. He was heading back to Manila after a speaking engagement at three educational institutions in Cebu on March 16, 1957 when the presidential plane "Mt. Pinatubo" crashed on Mt. Manunggal. Manunggal is a mountain range curving like an arm just north of Cebu City. It's such an obscure mountain, Its peak rises about 3,000 feet above sea level. At that time, the lower slopes have been deforested by kaingins; the upper slopes are steep, ending not on sharp peaks but on rough plateaus. From the center of the range springs a river, the Balamban, which winds all around the mountain and its base and then flows through the western part of Cebu island into the sea. The wreck of Mount Pinatubo (Photo credit: Philippines Free Press, March 18, 1961). Ten minutes after it left Cebu, the Mount Pinatubo confronted Mount Manúnggal and was flying toward the central plateau of the range, which is the source of the Balamban. The plane had lost altitude – from "metal fatigue", according to investigation – but could have cleared the mountain and flown safely beyond it but for a giant tree standing on the summit. As plane and tree collided, the passengers inside were hurled against or out of their seats and the tree sliced off one of the plane's wings. This wing was found near the foot of the tree. The crippled plane itself dropped much further down, about a hundred feet down the slope, which explains survivor Nestor Mata's sensation of “hurtling down a black bottomless pit”. When the plane hit the ground, it exploded and burst into flames. The fire – so intense it melted metal and fused bodies into an almost solid lump of coal– raged most fiercely nearest the fuselage but spared the tail and cockpit. The passengers seated nearest the fuselage –there were apparently seven of them, including the President– were burned beyond recognition, were turned into a single mass of charred flesh. The President was identified only by a wristwatch and ring embedded in the black mass. About 14 other bodies, also horribly burned, were thrown out of the plane by the explosion and scattered lower down the hill. A few feet away was another group of bodies that had been only partially burned. Two of the pilots, General Benito Ebuen and Major Florencio Pobre, were apparently hurled forward, still strapped to their seats, against the engines. The first had his skull broken; the second had his head ripped off. 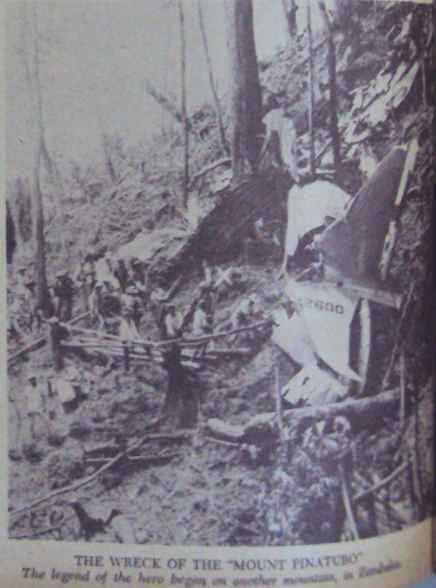 A security officer, Major Felipe Nunag, seems to have survived the crash, though wounded in the head, and to have crawled out of the wreckage and some distance down the slope, quite a trip for a man who was dying and must have known it. His was one of the few bodies found intact. The only survivor, reporter Nestor Mata of the Herald, may owe his luck to the fact that he was thrown out of the plane at the very instant it hit the ground. He had been dozing, was jolted awake by a flash – "like thousands of flashbulbs popping at one time" – felt himself flying, and heard the deafening boom of an explosion. He blacked out. When he came to, he found himself lying under tall trees, among twisted bits of metal. Magsaysay's vice president, Carlos P. García, who was on an official visit to Australia at the time of the tragedy, assumed the presidency to serve out the last eight months of Magsaysay's term. 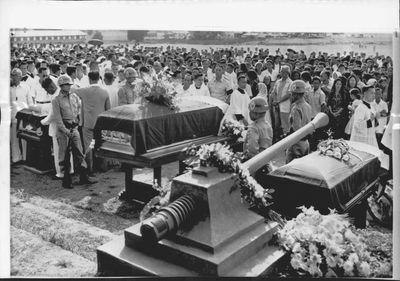 President Ramon Magsaysay funeral in 1957 (Photo credit: Wikipedia Commons). An estimated two million people attended Magsaysay's burial on March 22, 1957 at the Manila North Cemetery. 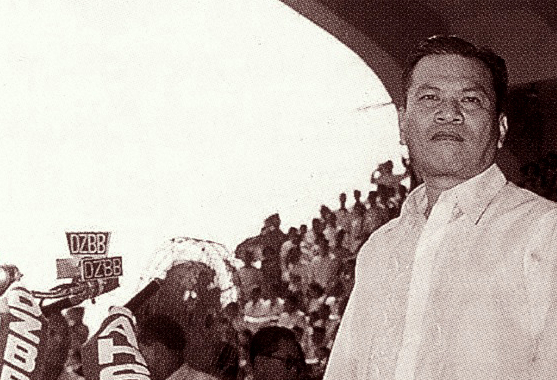 Magsaysay became active in fighting against the expansion of communism in the Asian region. He made the Philippines a member of the Southeast Asia Treaty Organization (SEATO) which was established in Manila on September 8, 1954. Magsaysay's active coordination with the Japanese government led to the Reparation Agreement between the Philippines and Japan, obligating the Japanese government to pay US$ 550 million as reparations fund for war damages in the Philippines. Congress approved on August 11, 1955 a legislation empowering Magsaysay to break up large landed estates and distribute the same to tenant farmers. To honor and perpetuate Magsaysay's memory, the Rockefeller Brothers Fund established the Ramon Magsaysay Award in 1957.